Has it been pouring like cats and dogs? So let’s get inspired by the drops of rain and paint your nails with the latest nail art designs which are inspired by monsoon! It has been raining non-stop! Infact it rained the entire weekend, and there wasn’t much that one could do so I felt like pampering myself. I dipped my hands and feet in some lukewarm water and gave myself a DIY manicure and pedicure. It felt heavenly. And thereafter, I painted my nails with rain drops. Yes! Literally. 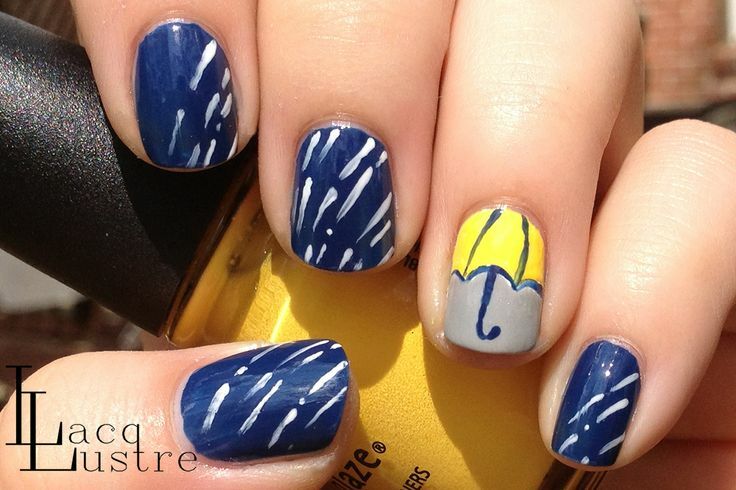 So, take a look at 16 latest nail art designs that are inspired by monsoon motifs. The glory of blue rain drops, gray sky, white fluffy clouds, splendid colorful rainbow, the umbrella man and everything that has got to do with rains. All you have to do is look out of your window, get inspired by the view out there and just stick with the theme that represents the ongoing weather. Go rainy this July and August. 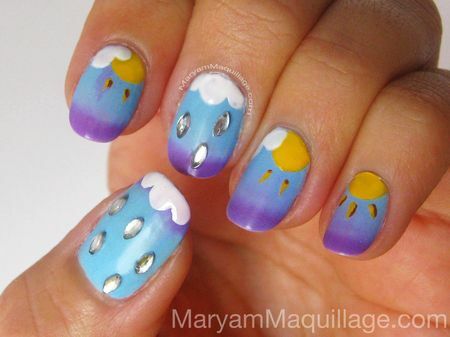 There are quite a few ideas that can help achieve the rain inspired nail art look. Go for a soft blue base coat and apply white tips with silver glitter for a bit of a rain drop effect. This is the simplest design to opt for. If you are good with sketching, then opt for an umbrella, you can also add a human figure to it. Make one and fill it up with colors. You can also draw your inspiration from the British weather- cloudy sky with sunny intervals. However, my favorite is the ‘real’ rain drop design. For this, you need to apply matte top coat over blue nails and once dry, add blobs of shiny top coat, making sure that they were properly domed to give a 3D effect. The process of drying might take longer than usual but I am sure the after-effect is going to turn out really well. Nails will look great. It will give an impression that they have been splashed with water. Isn’t that cool? Team up these gorgeous nail art designs with ultra-cool outfit theme. Denims for a casual day-time dressing or a short white dress for a Sunday brunch. A long, flowy gown at night or perhaps an elegant saree for a formal event. Give your face a suave look. Soft smokey eyes, coral lips, peach or rosy pink blush, winged eyeliner, mascara and a light colored eye shadow which is waterproof.